Even if you’re doing your best to cook root-to-leaf and nose-to-tail, there are probably still some edible bits you’re missing. Every other Sunday, we'll focus on one overlooked scrap, and show you how to turn what would otherwise be trash into a dish to treasure. Today: Stem your waste of mushroom stems. Foraging season is upon us, which means that our mycophagy (you’ll remember that’s the practice of consuming mushrooms) is in full swing—even if said foraging happens in the aisles of our local supermarket. 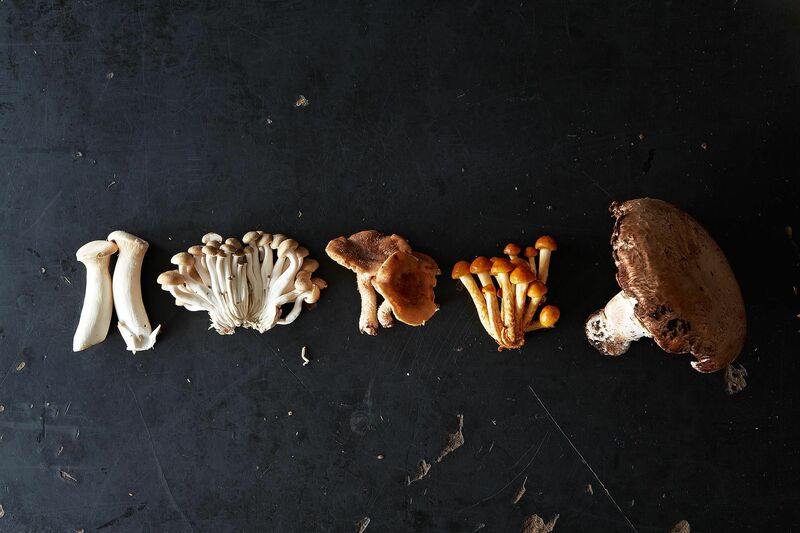 But unless you’re dealing with mushroom varieties that are more stem than cap, like enoki or trumpet, there's one part of mushrooms we’re not always consuming: the stems. Since shiitake mushroom stems can be tough and woody, these mushrooms are usually trimmed close to the cap. But that doesn't mean the stems need to go into the compost bin. If your shiitake mushrooms are very fresh, you can finely chop the stems and cook them. If they are older and the stems feel quite firm to the touch, then your best bet is to add them to a pot of stock or a batch of gravy give your dish more flavor. Other types of mushrooms, like cremini and portobellos, can be trimmed very close to the base. Even though their stems don’t necessarily have to go to waste, a lot of recipes call for them to be removed regardless. It's time to stop discarding the stems rather than saving them for another use: Even if a recipe calls for the stems to be removed, you can just chop them up and use them along with the caps in dishes like pasta sauces, stuffing, noodle dishes, or vegetable paté. More: The real question is, to wash or not to wash mushrooms? Here's everything you need to know about prepping mushrooms. Lastnightsdinner's Velvety Mushroom Soup is a great way to use up your mushroom stems, and its taste lives up to its name: It truly is velvety—without the use of any cream—and it's also intensely mushroomy, thanks to the trifecta of mushroom stock, dried mushrooms, and fresh mushrooms. The base doesn't start with a mirepoix, but you won't be missing out on any flavor: The mushrooms are deglazed with sweet vermouth, fresh thyme is used in both the stock and the soup, and a Parmesan rind (along with all of the mushrooms, of course) provides umami. Note that the recipe calls for more shiitake stems than caps. Plan to cook this soup after you make another recipe calling for shiitake mushroom caps, or simply use any extra shiitake caps in place of some of the cremini or white button mushrooms. 1 ounce wild mushrooms, such as shiitake, oyster, maitake, chanterelles, etc. Know of a great recipe in the Food52 archives that uses scraps (anything from commonly discarded produce parts to stale bread to bones and more)? Tell me about it in the comments! lindsay, you asked for recipes that include veggie trimmings/scraps etc. While this is not exactly what you asked, it is strongly related: while working in professional kitchens ~ 30 yrs., one of the biggest wastes and routine habits that always surprised(horrified) me was a) cutting off and discarding the white part of scallions; and b) picking off and discarding the non-stem tips of green beans and snow peas, and the caps of okra; and c) peeling carrots and jerusalem artichokes. NOOOOOO! For a) and b), there is no need to cut off and discard those parts.Eat them as part of the vegetable. And for c) remember that a vegetable's skin holds a concentration of its nutritive values. Don't peel them; just scrub them well! These are good points, thanks LBF! this is an excellent feature.the one thing i would like to mention, w/regards to shiitakes, is that i have changed my mind about dried shiitakes, after many years. I always used asian dried shiitakes for asian soups (like my Beef Udon) or Japanese Chawanmushi (savory egg custard with additions) or chinese dumplings, spring rolls etc. But recently I found my dried shiitakes to be pest-infested and I had fresh shiitakes on hand, so I used only the fresh ones, for a few recipes. WOW! I use mushroom stems when I make stuff mushrooms, chop them finely in food processor with garlic & ginger heat oil add the chopped stems add salt if it leaves lot of water add some bred crumbs cool it and stuff the mushroom caps to bake it. I am always ready to try a new recipe for mushroom soup! I have never trusted myself to forage for mushrooms and not kill off my friends in the process...I leave finding safe mushrooms to the experts. One of the benefits of a forest fire (I know this is hard to believe} is that many plants experience a "rebirth" after a fire such as morel mushrooms. They are often called fire mushrooms and especially proliferate after a fire. Question: Can I freeze mushroom stems until I have plenty to use for recipes like this one? Cooking for two, it will take a couple of weeks to have enough scraps. Thanks! You can! I usually have a bag in the freezer where I keep my stems until I have enough for this soup. wonderful recipe! i have a very similar one here on Food52 that is made with no butter or cream as is done in Italy (a recipe my family of wild mushroom hunters taught me). i will need to try your version too now as this is right up my alley. 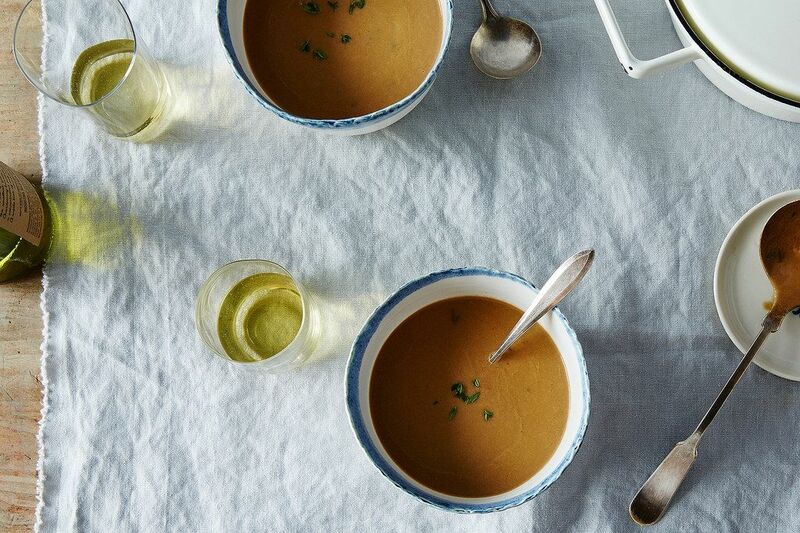 Would you care to share your version of no butter no cream mushroom soup, or give us the link to it. that is something I would prefer. Thank you in advance. I would love the share, too, for the wild mushroom soup! Dairy-free is what I'm hoping for. Many thanks! I need to add my mushroom soup recipe here in Food52... been busy traveling and working :)... you can find it on my blog at www.cucinadimammina.com as well, thanks for the inquiry and I will be posting it here soon!